A world cup is inevitably a time of reflection about how we approach our rugby. Following this last iteration Patrick Leclezio prescribes how to get the most from your viewing. First published in Prestige Magazine (November 2015 edition). I lost the plot during that fateful 2011 quarter-final. As in berserk. At the special viewing arranged for us by the hotel at which I was staying in Mauritius, attended by me and two Brits, I conducted myself in less than ambassadorial fashion. We lost both the game and a couple of potential tourists on that day. Reflecting on it now, I needed fortification. I needed the pleasantly tranquilising effect of a stiff drink. I don’t drink before 11am as a rule, so the time zones conspired against me on that occasion. This time I didn’t make the same mistake. 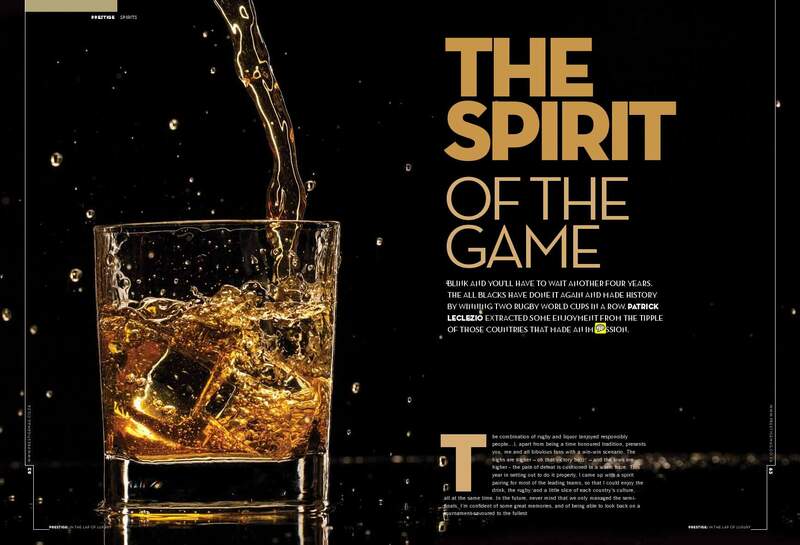 The combination of rugby and liquor (enjoyed responsibly people…), apart from being a time honoured tradition, presents you, me and all bibulous fans with a win-win scenario. The highs are higher – oh that victory buzz! – and the lows are higher – the pain of defeat is cushioned in a warm haze. This year I set out to do it properly. I came up with a spirit pairing for some of the leading teams, so that I could enjoy the drink, the rugby, and a little slice of each country’s culture, all at the same time. It’s the ultimate rugby viewing template – for World Cups and for between World Cups. In the future, regardless of how we fare, I’m confident of some great memories, and being able to look back on tournaments and matches savoured to the fullest. Join me on my journey. There’s a bizarre category of drinks known as bitters, and, whilst the constituent products differ substantially one from another they’re typically a witch’s brew of herbaceous ingredients. One of the world’s best-selling bitters is Fernet Branca, for which the brand largely has Argentina to thank. The Argies love this stuff, knocking back millions of litres per year – with coke or soda, or neat as a digestif. These guys are a bit dodgy with their application of the laws – give them a clueless French referee and they’ll make hay till the final whistle blows – but one has to admire how their game has progressed, and the passion with which they play it. When they started bawling during the singing of their national anthem I was raising my glass of Fernet Branca to the West in salute. After those feet in ancient times walked upon England’s mountains green they would have been grateful I’m sure for a cool, tall glass of Pimm’s – maybe on a pleasant pasture – to refresh and restore. There is no more quintessentially English drink. Garnished with strawberries to colour match the red rose on an England jersey, and entwined as it is with a setting of green English turf, it is an all-appropriate accompaniment to that country’s rugby endeavours. French rugby is a bit hit and miss, much like the drink I’m advising for watching their matches. Pastis, an anise-flavoured (specifically using star anise as an ingredient), unmistakeably Mediterranean spirit, is one of France’s most popular drinks, particular in the south of the country – corresponding loosely (more east than west) to the area where rugby also predominates. It’s a cliché of French rugby that they either pitch up or they don’t. Similarly you either like the polarising anise flavour or you don’t. There’s limited choice in SA but Ricard pastis, bedrock of the eponymous liquor giant Pernod Ricard, is generally available in local stores. It’s usually mixed with chilled water and ice, resulting in an iconically cloudy, superbly refreshing liquid – best enjoyed whilst watching French rugby…or at a street-side café in Marseille. The most underrated style of whiskey, like its perennially underrated team, comes from Ireland. Single pot still is Ireland’s traditional style, a full bodied whiskey made from both malted and unmalted barley that inexplicably lost popularity at one time, but that’s now back with a test-match winning intensity. I recommend answering Ireland’s call with Green Spot, an orchard-in-a-bottle exponent that’ll transform your rugby viewing into a total sensory experience. It’s a great reason to catch as many of Ireland’s games as possible. The colour correspondence by the way is completely coincidental, but surprisingly pleasing nonetheless. Our flagbearing sports team and our signature spirit – it’s a union ordained by the sporting and spirituous gods. Rugby in this country is synonymous with brandy, particularly blended brandy, so I’ll signal my support accordingly – with one of the best blended brandies that I’ve yet had the opportunity to taste: the Carel Nel 15YO from Boplaas. Let’s hope we’ll be drinking it in more frequently victorious circumstances in the future. 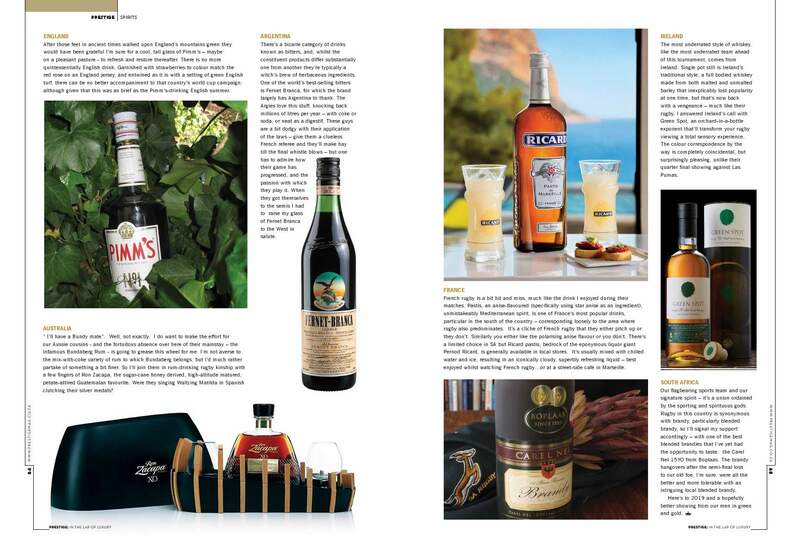 This entry was posted in Spirits column and tagged Boplaas, Carel Nel, Fernet Branca, Green Spot, Pimms, Ricard, Zacapa. Bookmark the permalink.